April is Volunteer Appreciation Month, and the perfect time to recognize our amazing volunteers. Second Harvest Heartland presents the 2019 Hunger Hero Awards, adding a new category this year! 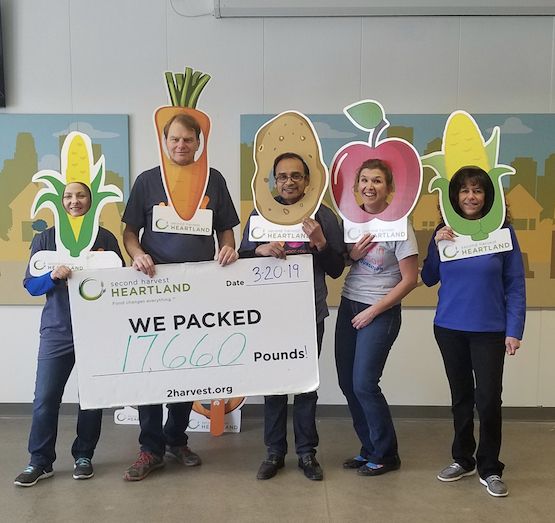 After getting to know Second Harvest Heartland through volunteering and networking, a loyal donor makes the informed decision to become a legacy donor. A generous grant from the Joy in Childhood Foundation will help Second Harvest Heartland and its partners provide more meals to kids this summer and beyond. Second Harvest Heartland breaks ground on new Brooklyn Park hunger-relief campus. Micah counts on Grab N' Go breakfast to keep him energized all morning long. Best friends Malaya and Tianna count on Grab N' Go breakfast to keep them going strong all morning. Emily counts on the Grab N' Go breakfast program at her school to keep her stomach full and her mind on her schoolwork. Cummins Partners with Second Harvest Heartland to help feed our hungry neighbors. On Thursday, March 14, hunger relief advocates from around the state will come together for Hunger Day on the Hill. Join us! It’s National School Breakfast Week and the perfect time to recognize one of our breakfast heroes fighting child hunger and working to make breakfast a regular part of the school day. How do you keep kids energized and homework-ready at the end of the school day? With a Super Snack of course! Submit a video of yourself in your kitchen and you could be featured in a special video at our signature fundraising event, Dish: Cuisine for Change. Ann has been disabled and unable to work nearly her entire adult life. Without SNAP, she couldn’t afford to feed herself.